WhatsApp has been consistently rolling out updates for its messaging application and now it’s supposed to receive another feature which will require WhatsApp group admins to send invitations to users if they want to add someone to the group. Only after the user accepts the invitation will they be added to a group. According to a report on WABetaInfo, the feature will be called Group Invitation and is currently available to iOS beta users. Android users will probably get it in the coming months as well. 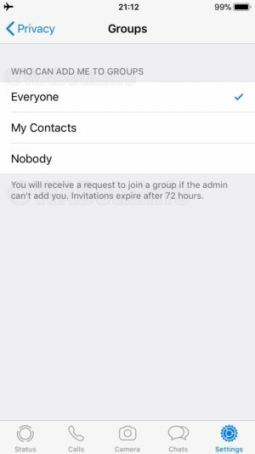 When the feature does go live for all, iOS users will see a new option called Groups, which they can enable the Group Invitation system, so that whenever someone tries to add you to a WhatsApp group, you are sent a prompt to accept or decline the invitation to the group. As of now, anyone can add you to a WhatsApp group without your permission which can be very annoying as you can wake up finding yourself in some random group. But with this feature, you will have control over the kind of group you want to be a member. Who can send me an invitation? Anyhow. Under the Groups settings, you will have three options to choose who can add you to a WhatsApp Group — Everyone, Contacts Only, Nobody. When you choose Nobody, for any group you are added to, you will have the liberty to accept or decline the invitation to join the group. If you choose Contacts only, then you will only see the invite prompt, when someone who is no in your contact list adds you to a WhatsApp group. And if you keep the settings on Everyone, then like it happens currently, anyone will be able to add you to a group without your permission. Further, the report says that users will have only 72 hours to accept the invitation to join a group, after which the invite will expire. Once an invite expires, users will have to wait for a new invitation or use a group invite link.